Ruthless power and tons of options. See what makes Stampede™ the new standard in side-by-sides. SUSPENSION AND HANDLING: Four-wheel independent suspension and front/rear sway bars give you the best ride possible. HAULING AND STORAGE: The only side-by-side with a customizable extended cab, plus 2,000 lbs. 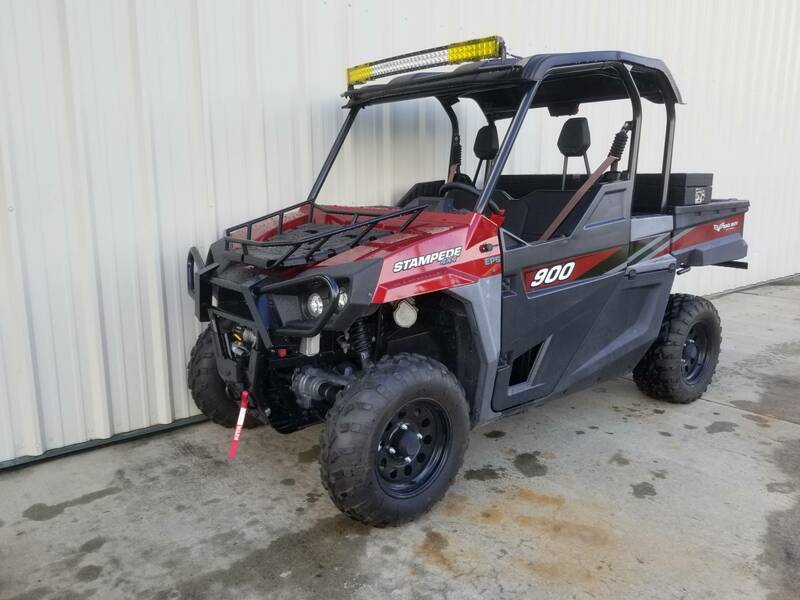 of towing and a 600 lb. capacity tilt bed. RELIABILITY: World-class engineering and a two-year warranty give you plenty to count on with Stampede. EASY ENTRY/EXIT: With a spacious 10 sq. ft. opening, you can get in and out of Stampede with ease. CONTOURED SEATING: We put 39 in. between the ROPS and seat, and another 31 in. between the instrument panel and seatback. 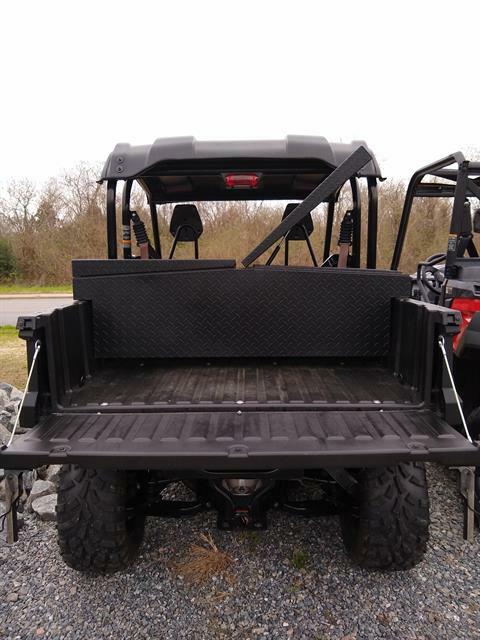 It adds up to give you ample space and comfortable command of Stampede. 40-INCH FIELD OF VISION: Want to see what you’re missing in other side-by-sides? Step into Stampede, with a 40 in. unobstructed view out of the front. SEAT BELT SPEED REGULATOR: Stampede won’t run faster than 10 mph unless your seat belt is buckled, helping to keep you safe every time you drive. STANDARD FULL-COVERAGE DOORS: On Stampede, even the doors are tougher. Our impact- and corrosion-resistant doors are safer, more durable and easier to clean than traditional mesh nets. Plus, they make it easier to get in and out of the vehicle. INDUSTRY-LEADING LCD SCREEN: Get instant feedback on fuel level, engine temperature, RPM, gear position and diagnostic codes from our industry-best 5.25 x 3.25 in. LCD display. Designed for high visibility in any light. CUSTOMIZABLE EXTENDED CAB: Take all your gear along for the ride with Stampede’s one-of-a-kind extended cab. Built to haul everything you need – and keep it all easily accessible. 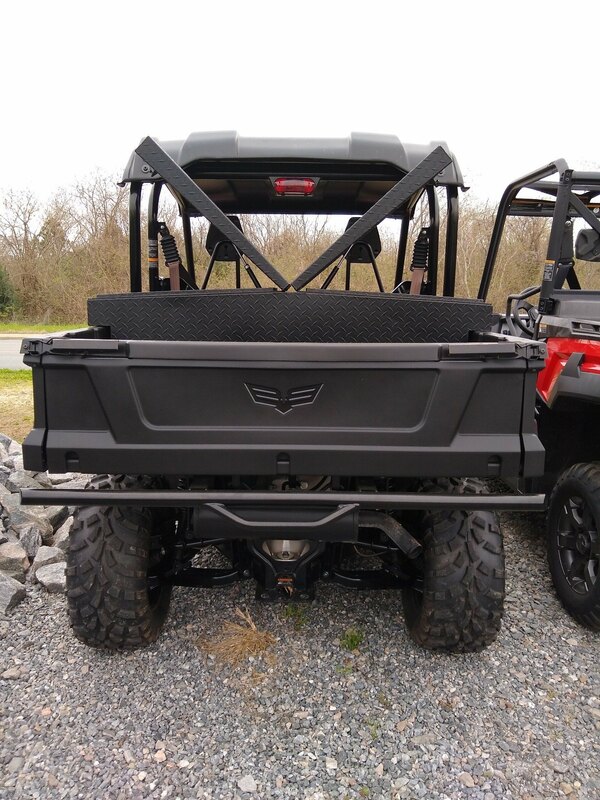 SPECIALIZED STORAGE: Within Stampede’s extended cab, you’ll find compartments that are custom-built for your gear. Guns, bows and tools fasten right into protected cab space, staying safe, secure and easily within reach. 24 CUBIC FEET OF STORAGE: If you can't fit it in Stampede™, you don't need it. Between the bed, dash pockets and extended cab, Stampede boasts the most cubic feet of storage in its category. 2,000 LB. TOWING CAPACITY, 600 LB. CAPACITY TILT BED: Tow, haul and flat-out dominate. Stampede is built for any job, with all the power you need for a day of work or play. 80HP & 846CC ENGINE: The numbers don't lie. 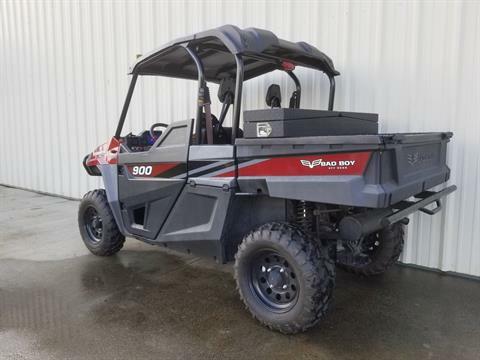 80HP and an optimal power-to-weight ratio that helps you do more, more efficiently. Stampede's robust engine uses 846cc of displacement to deliver more power, from an engine that knows how to use it wisely. ELECTRONIC FUEL INJECTION (EFI): Better fuel efficiency means more time riding - and less time fueling up. Our EFI engines deliver the right amount of fuel at the right time, to make the most of your ride. 59 FT. LBS. OF TORQUE: Accelerate, climb, tow and conquer. 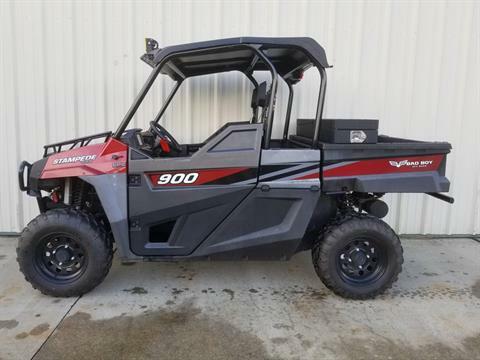 Stampede's engine delivers big-time torque throughout its rpm range to help you dominate any challenge. PRECISION TUNING: This beast was precision-tuned by the same hands and minds that make engines for high-performance sports cars. Germans know engines, and they built this one to make sure you get every ounce of Stampede's torque, horsepower and acceleration. DRY SUMP OIL SYSTEM: Stampede's engine runs like new for years to come thanks to its innovative dry sump oil system, which creates lower oil temps, less friction and better oil life. 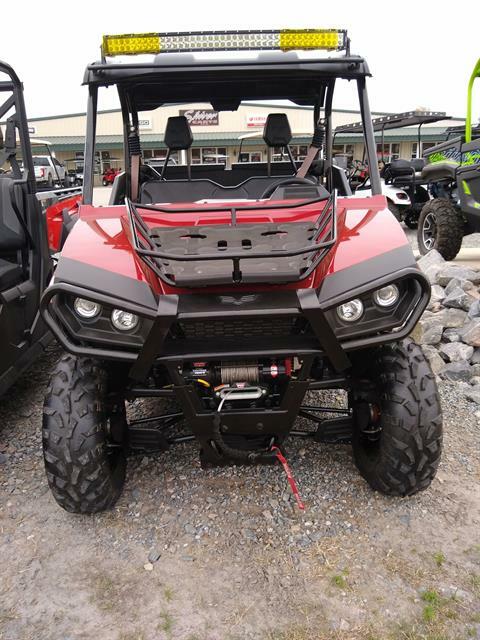 FORGED INTERNALS: With a forged crankshaft, camshaft and connecting rods, Stampede's engine can stand up to extreme conditions and long hours without breaking a sweat. ON-BOARD DIAGNOSTICS: Even the most reliable engines need a little love. 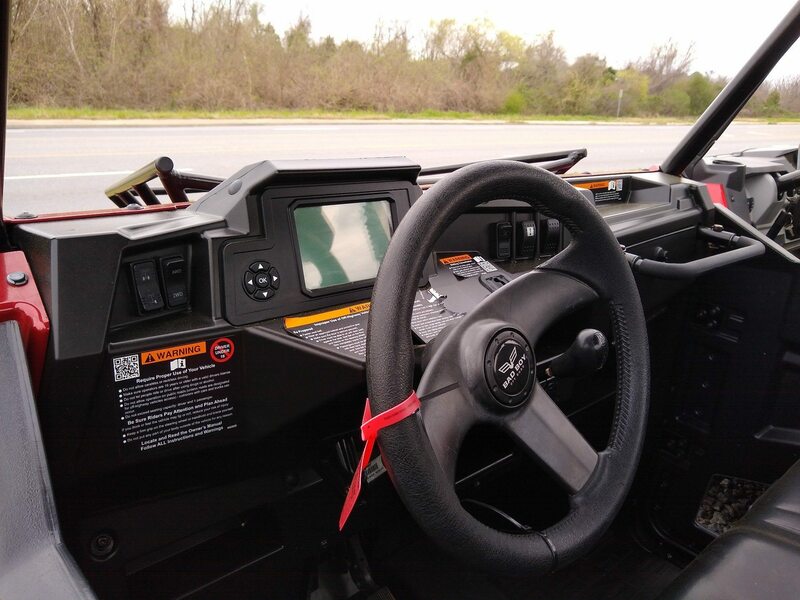 We built an on-board diagnostics code reader and reporter into Stampede's LCD display, so you can quickly identify and fix any engine issues. ROBUST 2-YEAR WARRANTY: Years of testing, exacting standards and precise craftsmanship. We don't think you'll need our two-year warranty, but we've added it to give you more peace of mind. AGGRESSIVE TESTING: Before you put Stampede™ to your test, we put it through ours. In the lab and in the field, we've subjected it to 800 hours of nonstop use. It's also weather-tested from 0º - 120º F, and each component is separately stress-tested to strict standards. We pushed Stampede's limits so you can push yours. 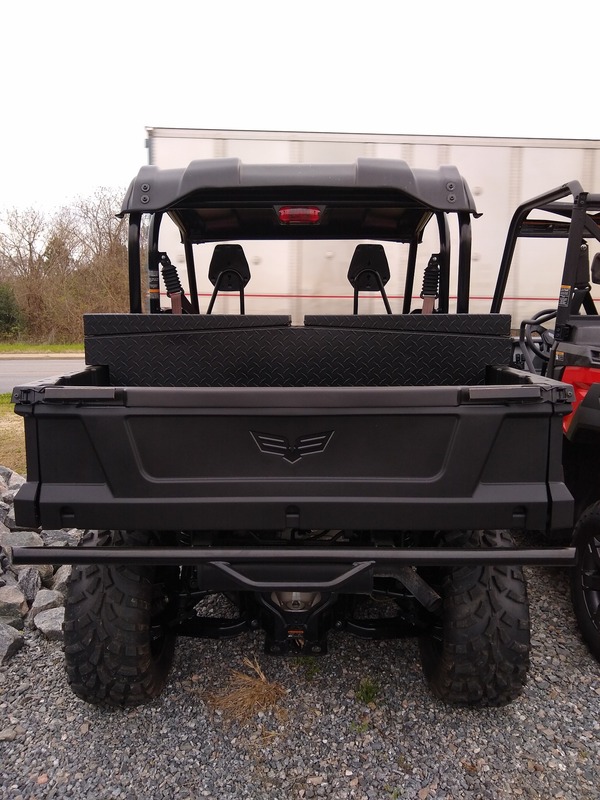 AWARD-WINNING U.S. MANUFACTURING: This vehicle is manufactured at our state-of-the-art facility in Augusta, GA, home of Textron Specialized Vehicles. 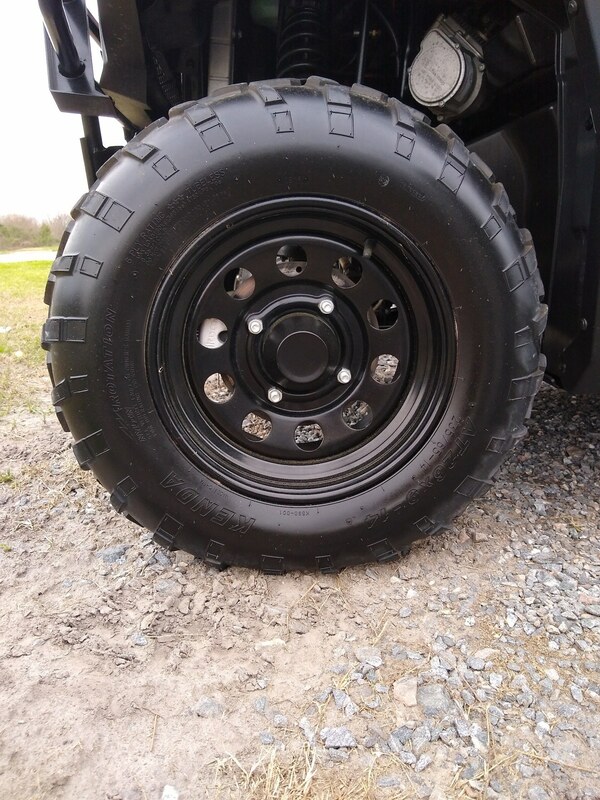 The facility is designed to ensure that every inch of your Bad Boy® is ready to ride on day one, with rigorous end-of-line testing, laser wheel alignment and automated systems for total consistency. BACKED BY THE POWER OF TEXTRON: Been there, done that. Bad Boy is part of the Textron family, which has experience in building manufacturing brands like Bell Helicopter, Cessna®, Beechcraft® and Jacobsen®. Our engineers have also spent decades building high-end, off-road racing vehicles and automotive and military technologies. FOUR-WHEEL DOUBLE A-ARM SUSPENSION: Stampede can take a ton of punishment - and doesn't mind dishing it out, either. But you won't feel an ounce of it thanks to precision-tuned four-wheel independent suspension, which features 9.5 in. of travel in the front and 10.5 in. in the rear. 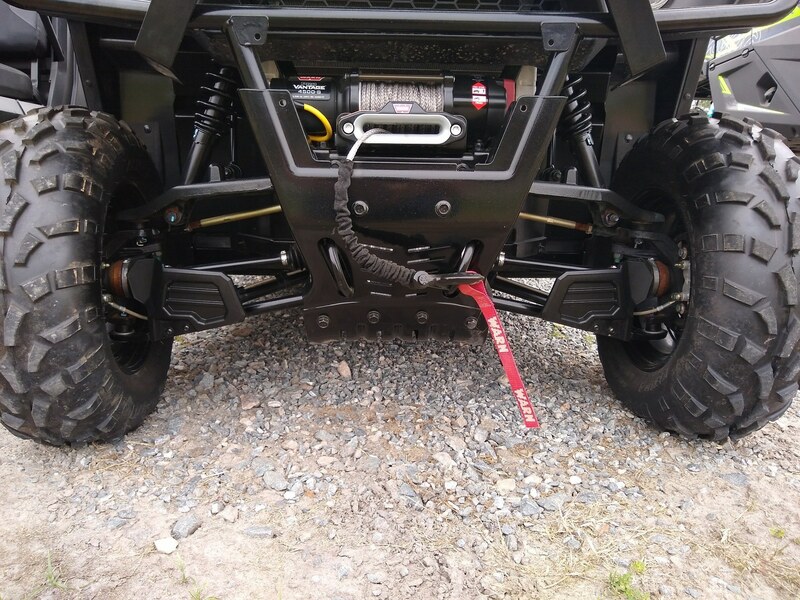 From springs to shocks, our suspension system effortlessly conquers challenging terrain. FRONT AND REAR SWAY BARS: Making turns over rugged terrain can throw drivers around the inside of a cab – unless they're driving a Stampede. The front and rear sway bars reduce body roll while you're cornering, so you get all the handling you need without sacrificing a smooth ride. ON-DEMAND AWD DRIVETRAIN: Stampede’s selectable AWD is ready when you are. Precision-tuned clutches provide maximum engine braking to slow the vehicle and reduce brake wear. ELECTRONIC POWER STEERING (EPS): Power doesn't have to stop at the engine. Take command with a Stampede EPS model and get the most responsive steering available. MAXIMUM GROUND CLEARANCE: With 11.25 in. 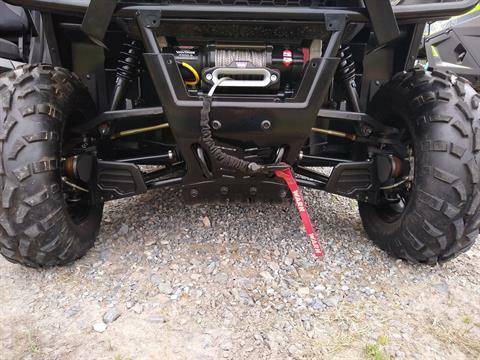 of ground clearance, Stampede avoids most obstacles before they ever become a problem.